"The Prince looks at the blue sky and the intense blue of the sea. This is the most beautiful island, perhaps the most beautiful island in the whole of the Mediterranean. 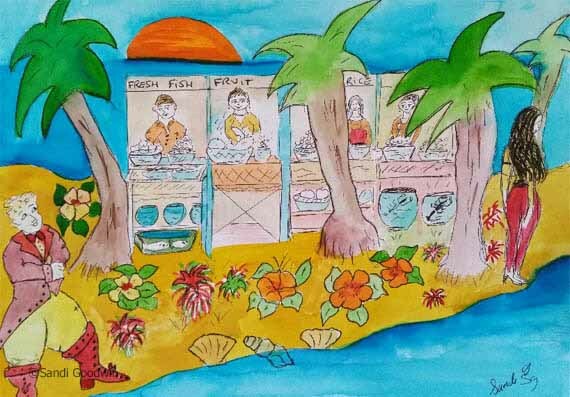 He is there looking at his island, the palm trees, and the market with all the fresh fruit, melons, grapes, and pears, and pineapples, and the delicious prepared food laid out on long tables for people to buy. There are rice dishes, all types of meats, fresh fish, lobsters, and shrimps which you like to eat as well." The boy smiles and puts his fingers in his mouth. He is quite still and listening. "Then the Prince sees her. She is in the distance but he recognizes her even though he has never seen her before. He knows her because she is someone he has been looking for. She has a magical aura and she notices that he is looking at her but she moves away in the dense tangle of the crowd." "Why didn't she want to meet the Prince?" "Well, we are about to find out." "The Prince is overcome with his desire to meet this girl and rushes into the crowd, which parts before him, bowing like wheat in the wind. But he cannot find her and he returns to his Palace feeling unhappy. Later that day he decides to walk to his private beach and swim. He loves to do this and he is a good and strong swimmer. He can even dive into the water from a rock. The water is cool and delicious and it changes his mood so that he feels as though he is a fish playing in the waves with all the other fish. He dives from his rock and splashes into the sea. "His mother sees him from the Palace window and smiles at her son. She notices a girl walking on the beach approaching her son. 'Now how on earth did she get here when we have all those Palace guards,' she wonders? It is not someone she knows and the Prince has not seen her yet. The girl walks to where the Prince is swimming, steps out of her small dress, and dives into the water. She disappears for a few seconds and then reappears near the Prince who does not see her but instead seems to stop in the water looking up into the sky. The Queen decides to come down to the water to understand exactly what is happening so she leaves the window and walks quickly through the Palace and out of the main gates to the sea. She comes to the place where the Prince is swimming but cannot see the girl. So she calls to her son and he swims over." Where is the girl? asks the Queen. What girl? says the Prince. She was here and she swam out to you. But I saw no one! "The Queen looks very puzzled because she is certain of what she has seen. The Prince is also troubled and from the Queen's description can only think that it is the same girl he saw that morning in the market. They return to the Palace and the Prince goes to his rooms to bathe and to dress in fresh clothes but he can only think of the girl. That night he has no appetite for dinner and decides to walk into the town. Eventually he finds himself at the farthest end of the long road that stretches from his Palace to the bay where the fishermen moor their boats and mend their nets and gather their catch from the sea. He approaches one of the boats and touches its wooden frame made coarse and seasoned by its many years out in the rough ocean. 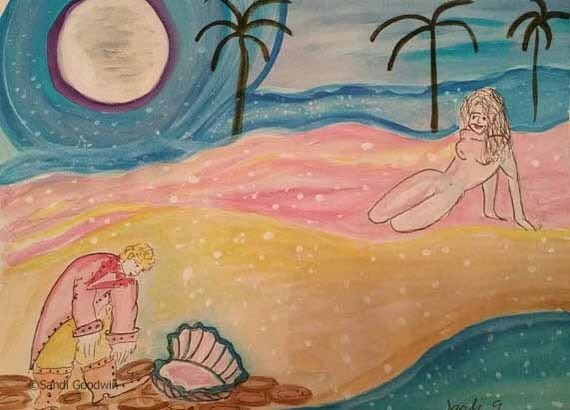 The Prince loves the sea at night because you can hear it on a calm day sing its quiet song to the sand. It seems to stroke the sand trying to send it to sleep. But the sand wants to know what the sea has been doing since its life is so exciting and it is able to travel to all the ends of the earth. The sand has a boring life and never gets to travel. The sea tells its tales and the sand takes in the sound and the salty water. 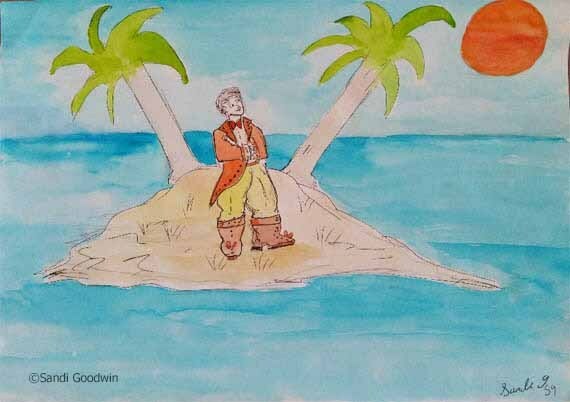 The Prince listens too and imagines that he can understand everything the sea is saying. The moon high above him is at its largest and brightest and its light allows him to see the full curve of the bay and all the fishing boats. He walks slowly and only then becomes aware that there is someone walking with him. He stops and looks but there is no one. So he walks on but again can feel and hear the soft sounds of other feet matching his exactly." Isn't this the most perfect night? He asks. Yes, it is and it's because of the light. The moon and the sea have decided to play with each other and they have made me invisible in the process. "It is a girl's voice and it sounds like the sea speaking." Just here at your elbow. I am looking at you now and you are very beautiful. I have never seen such beauty before. I can hear your voice but I cannot see your form. If you want to see me then you must pick up a shell and let the light from the moon reflect on the mother of pearl. Its light will find me and you shall see me for the second time. "They smile at one another." "The Prince until this moment was not the slightest bit hungry. Now he feels that he could eat a whole fish. Yes I would love that. Then come with me and we will find our dinner together. 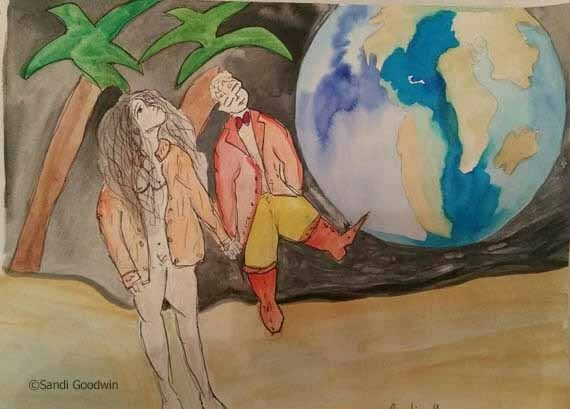 "She takes his hand and leads him down the beach. His clothes fall away at her touch and they both walk into the water still holding hands. The light from the moon plays with the sea and it attracts fish from the very depths to visit the surface and enjoy its gentle warmth. 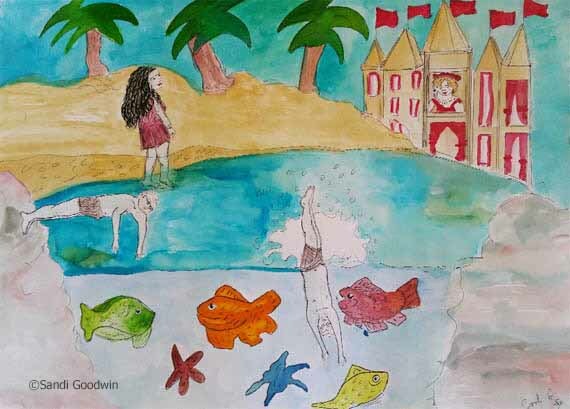 "The girl dives beneath the waves and the Prince follows her. He has never seen anyone swim like this before. She is as fast as a dolphin and can hold her breath longer than a whale. He sees her dive, spiraling down into the darkness of the sea only to return a few minutes later holding a fish. It is still alive and is happy and content with being held by the girl. It doesn't struggle and almost seems to swim pulling the girl along. 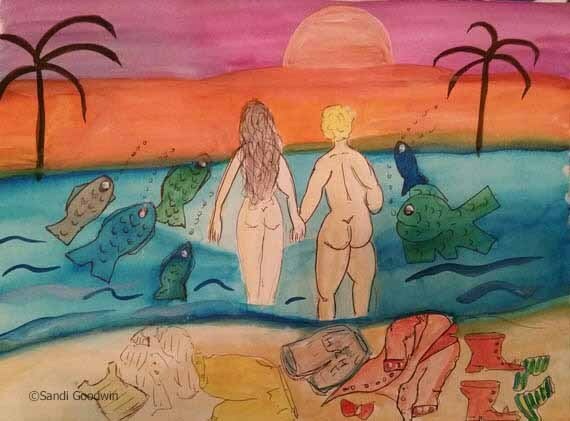 The Prince follows as she swims towards the beach where she stands with the fish in her hands. The fish is as still as a stone but not at all afraid." I will ask him if he would consent to be our dinner tonight. "The Prince says nothing and only stands and watches her, mesmerized by her quality of speech and her manner of being in the world. She whispers a song to the fish and then points to a fire just behind them, which the Prince had not noticed until that very second." Your clothes are here but let me dress in your shirt. I love to wear clothes when I eat. 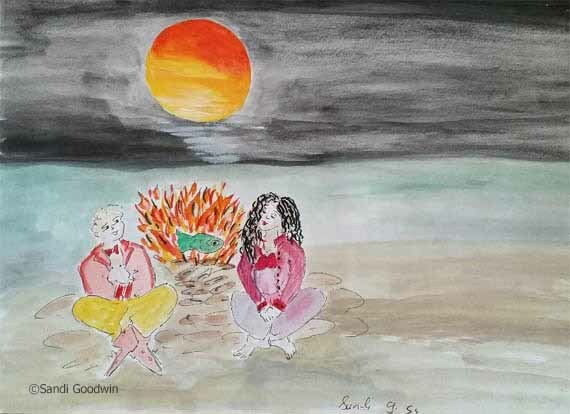 "The girl takes the fish to the fire, cleans it gently with her fingers and then places it in banana leaves from the side of the beach and puts it in the hottest part of the flames. Soon it is cooked and it gives off a smell of the leaves, the strong flesh and the smoke of the fire." Please you must eat first. Eat with your fingers and taste the immense joy that this noble fish has given to us with its life. "And it is true the Prince has never tasted a fish as good as this before. It reminds him of many things: his mother's cooking when he was very small, the taste of shells when you place them in your mouth, memories of happiness playing in the surf with his favorite servant Ahmed. She then eats and the food graces her lips and then disappears. A little drops on her legs and she scoops this up and places it in his mouth. He devours it like a shark. 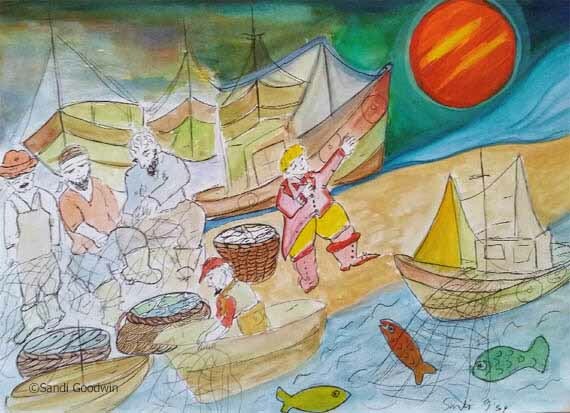 The meat from the fish seems to continue until they have eaten their fill and then they laugh and lie back on the sand looking at the moon, which seems now almost as bright as the sun." Have you ever been to the moon and then looked down on the oceans and the seas of the world that it controls? No of course not. No one has ever been to the moon. That is impossible. I have been there many times. Would you like to come with me? Come it is not very far. We can see it already after all. Just look up until the moon is the only thing you can see and then hold my hand and close your eyes. "The Prince does her bidding. He had no idea that the moon could be this big and he was relieved when he closed his eyes and felt her hand in his. But he can still see the moon even with his eyes closed. Then he can see the moon reflected in all the oceans of the world and from the greatest height. His toes touch the sand of the moon and he is looking at the girl who was still holding his hand and not looking at him but at the world above them. Is he dreaming, he thinks? Don't ask questions says the girl who is inside his head now, making him forget about practical and silly considerations that bind our feet to the earth and clay. So he forgets his questions and his earthly thoughts and like the fish that she caught with her tiny hands is led by her to watch the world and smile at its excessive beauty. Then after what feels like a lifetime he finds himself on the beach again but the girl is nowhere to be seen. All he has is a huge shell with the largest expanse of mother of pearl he has ever seen and his pantaloons ballooning in the gentle wind. His shirt has gone. "He stands for some time feeling the warm sea air on his body with his mind awash with the most extraordinary images. His mind is not thinking. It is feeling without questions and touching a part of his soul he has never known before. "Tomorrow night he will come again to the beach and ask the girl for his shirt and for her again to breathe something of her life and discoveries into his willing body."